This beautiful statement of loyalty makes its way into thousands of weddings each year. Incredibly, this wasn't originally a pledge of a bride or groom. 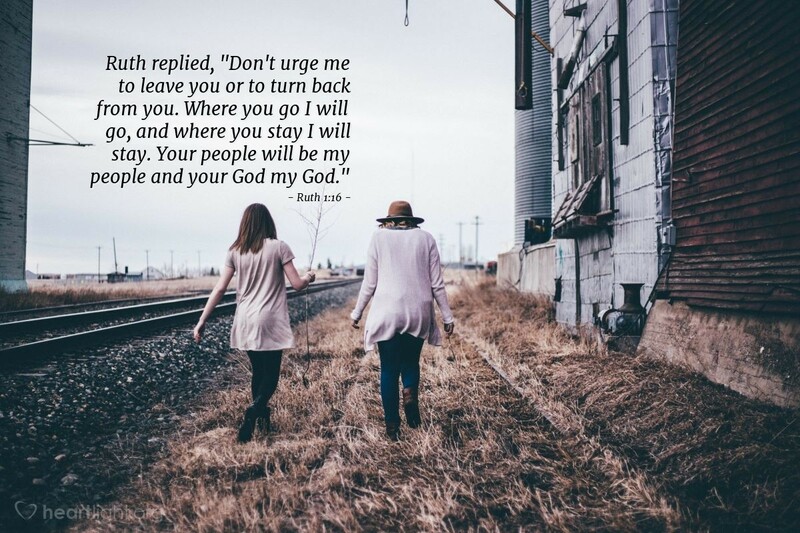 Instead, it was the pledge of Ruth to her mother-in-law — some would call her an ex-mother-in-law since Ruth's husband, Naomi's son, had died, but Ruth never treats Naomi as an "ex" of any kind. God loves loyalty and bestows his blessing and favor when we are loyal to others. In an era where people are thrown away as readily as paper plates and napkins, let's remember that loyalty is a quality that God not only loves, but it is also a quality that he defines for us in Jesus. So let's see loyalty to friends, to family, and to other followers of Jesus as a crucial commitment. Almighty and faithful God, thank you for your loyalty to your covenant promises to Israel. Thank you for not giving up on your people or your promises despite the fickleness and unfaithfulness of your people. Bless us today as we seek to be a loyal and honorable people, your true children in a turbulent and treacherous world. May the light of faithfulness that is seen through us beckon others to find stability and hope in your grace and in your people. In Jesus' name I pray. Amen.